Tracking a nexus point in time, the Doctor meets Dr Evelyn Smythe, a history lecturer whose own history seems to be rapidly vanishing. 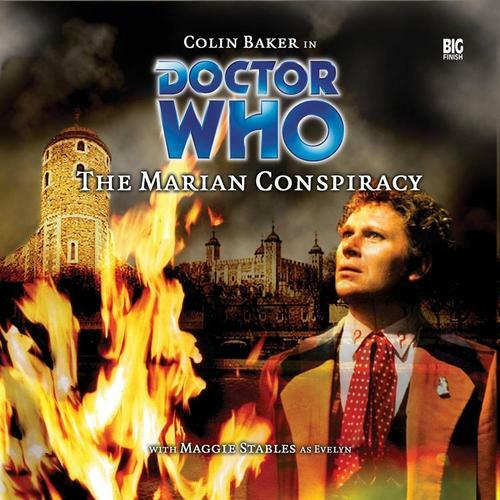 Colin Baker as the Doctor in…The Marian Conspiracy. Doctor Who was originally a show about history. Many of William Hartnell’s serials took the crew of the TARDIS to various points throughout time – Rome during the Empire, France during the Reign of Terror, and the Wild West are just several examples. There were few, if any, aliens or extaterrestial threats in these stories; the villains came from history, or thereabouts. While the show has always had one foot firmly placed in history, both past and present, the show has always added some sci-fi or mystical element for storytelling purposes, an example of which can be seen in the Five/Turlough serial Phantasmagoria. 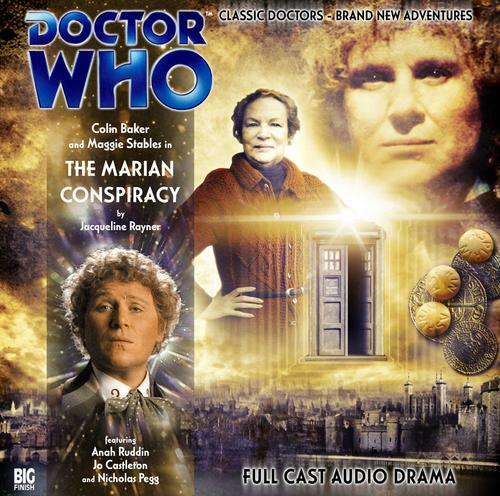 The Marian Conspiracy, however, is a direct throwback to those old Hartnell serials. No aliens, no magic, no technology gone wrong, it’s simply the Doctor and his companion dealing with historical figures, and what a companion she is! The Doctor is tracking a nexus point in time, and it brings him to the lecture hall of Dr. Evelyn Smythe, PhD in History, with a focus on the time of the Tudors, being a direct descendent of an advisor to none other than Queen Elizabeth. However, her family tree is disappearing, beginning with said ancestor. The Doctor and Evelyn travel back to Elizabethian England, where the Doctor plans to fix the nexus point and Evelyn plans to immerse herself in the local culture and experience life under the Queen…but NOT the Queen she thinks! Colin Baker was fabulous in Whispers of Terror, but his performance in this serial is absolutely amazing. As opposed to the loud, brazen, brash Doctor that would be familiar to those who watched the Sixth Doctor on TV, Baker plays this Doctor (sans Peri or Mel) as just as bombastic and boastful, but much less caustic and argumentative for the sake of argumentativeness. Instead, Baker is loyal, attentive, and refuses to see the world in black-and-white. There’s an absolutely great monologue in the third episode that drives this point home that Baker absolutely nails. What would you say if I were to tell you that I once destroyed an entire race, that I have led friends to their deaths and caused numerous wars. That my intervention has led to peaceful people taking up arms and good people having their faith or reason destroyed. Because I failed to act millions upon millions of people have been enslaved or killed. What if I had done all of those things but had always, always believed I was doing to the right thing! As always, a Doctor is only as good as his companions. 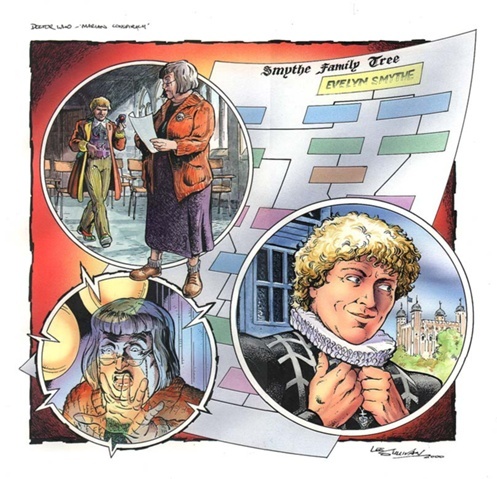 Evelyn Smythe is the first original companion created for Big Finish Productions, and Maggie Stables comes on the scene like she owns the place. When a strange man comes into her classroom, she dismissed the class and chides him. When the strange man shows up at her house, she attempts to prove him wrong about history even as she offers him hot cocoa and chocolate layer-cake. When he shows her that her history is being erased and he’s going back in time to fix it, she demands, as an historian, to go with him. And when she’s there, she throws herself into the time like she belongs there, never doubting herself or the Doctor the entire time. Evelyn is self-assured, self-confident, a little bit crabby, and not afraid to call anyone, even the Doctor, out. In short, she’s the perfect foil for Six. I’ve made mention of the fact that Five, Six and Seven and the “classic” companions so far have picked up where they left off in terms of chemistry, Evelyn Smythe and the Doctor make their own chemistry, making even an argument about family trees or how to escape from a dungeon absolute joys to listen to. The chemistry even expands to the supporting cast. The Doctor gets himself mixed up with the Queen of England, played by Anah Ruddin. Ruddin takes a figure who has been studied and portrayed time and time again and instills her with a sense of both sympathy and necessary brutality. Colin Baker shows off the wit, wisdom, and intelligence of the Doctor as he spars, comforts, and supports her. At-length conversations can derail an audio play as the listener finds their mind wandering, but Baker winds and weaves his way in and out of trouble with such skill, the listener wonders what’s coming next! Jo Castleton, as Lady Sarah, lady-in-waiting to the Queen, also provides some great dialogue with the Doctor. The quoted piece above is from one of their conversations. Sarah is quiet, calm, and hides her motivations under late The male members of the cast deserve praise as well. Barnaby Edwards as French ambassador Francois de Noailles, Nicholas Pegg as the Reverend Thomas, and Sean Jackson and Jez Fielder as working-class characters George Crow and William Leaf nail the intrigue of the upper class and the rough honesty of the working class. The writer of the piece, Jacqueline Rayner, manages to develop all the characters in the small cast wonderfully, and I really look forward to her next story, which, without giving anything away, is the first Who musical episode in the show’s history! The directions and sound effects are top-notch as well. The musical score, soft subtle strings, is understated, almost directly out of a BBC historical program. The sounds of London, the crackling of the fire in a pub, and a particular scene where the Doctor makes a big splash, deserve attention. Gary Russell once again does a great job. If there’s one drawback, it’s that everything comes together VERY neatly at the end. The time nexus is resolved in a very “oh, yes, that” manner, the conspiracies and plots are sensibly sewn up, people get what they deserve…but then it’s right back to the Doctor and Evelyn arguing about where to go in time and space for the best chocolate cake. Final Synopsis – While nearly every play up to this point has been solid, this is the first great-and-classic Big Audio production for the Doctor Who line. A throwback to the old historical serials of the First Doctor, the Doctor and his new companion immediately start a journey that will put them, at least in terms of the audios, in the same company as Two/Jamie, Three/Jo, and Ten/Donna. 5/5. Next up – Ares One: NASA’s first manned mission to the dead planet Mars. But is Mars as dead as it seems? Peter Davison as the Doctor in Red Dawn. This entry was posted in Big Finish Review and tagged Big Finish, Colin Baker, Doctor Who, Evelyn Smythe, Sixth Doctor, TARDIS. Bookmark the permalink.